Here’s another speedy soup for a cold winter night. (Well, when we cover our citrus trees to protect from frost it’s cold for Bay Area Californians, so we’re feeling it). With just a few more ingredients than Rita’s four ingredient Butternut Squash Soup this soup is hot and ready in 30 minutes or less. I created the recipe for Kikkoman Pearl® Soymilk, so it’s lactose-free and tastes creamy-rich. Use either the unsweetened, or the original flavor that’s lightly sweetened and complements the curry spice. 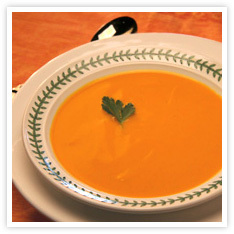 And when we break out of this “cold snap”, it makes a refreshing chilled soup too! Heat oil in a saucepan over medium heat. Add onion and cook 2 minutes, or until softened. Add curry powder; stir 30-60 seconds to lightly toast. Add carrots and vegetable broth. Bring to a boil, cover and cook 10 to 12 minutes, or until carrots are very soft. Stir in soymilk. Cook, stirring occasionally, over medium heat until heated through. Season with salt and pepper. Serve warm or chilled topped with parsley or cilantro. An original recipe by Rosemary Mark for Kikkoman Soymilk. Yumm. And healthy. I’m going to try butter in place of olive oil. Will let you know. It will be good with butter too, but vegans will stick with olive oil. Ah, yes! Good thinking Rosie. Let me know how you like it with butter! Can you substitute milk for the soymilk? If so, do you recommend whole, 2%, 1% or skim? Thank you! Any kind of milk can substitute for soymilk, it will just vary a little in richness depending on the type of milk. Thanks for asking! I like carrots as much a butternut squash. Will try this soup too. Thanks. So now you have two soup choices for two of your favorite veggies!